The installation of the version of GhostScript suitable for the iPaper version. Retrieve the license and activate the software. Configuration / distribution of the presets. Normally our setups are executed as EXE. The EXE setup contains both the 32bit and the 64bit MSI of the application. With the EXE installation certain automated steps are executed automatically. The installation prerequisites (eg .NET Runtime, presence of the correct GhostScript version, etc.) are checked and if components are not available or not in the correct version, they are downloaded from the Internet and pre-installed. Likewise, the EXE setup decides whether on the computer the 32 or 64bit version must be installed. Automated installation requires MSI installation packages. If the MSI packages are used, the installation prerequisites must be established correctly. It is also necessary to specify which version (32 or 64bit) has to be installed. 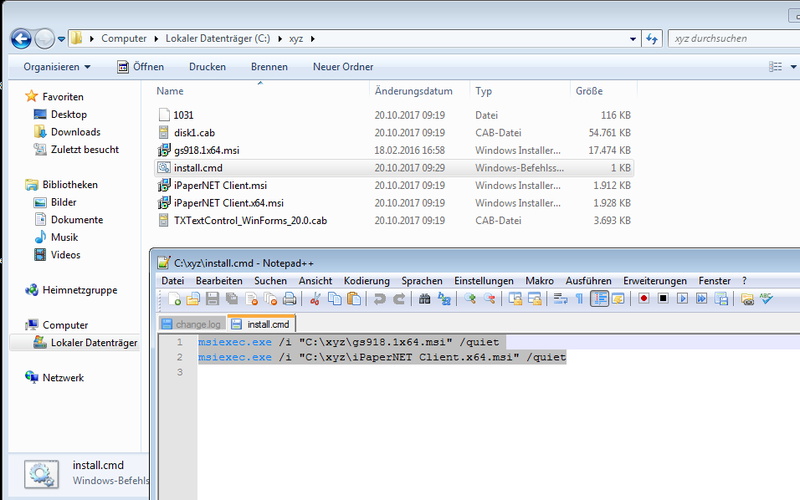 The “iPaperNET Client.exe” setup contains the required MSI files – but these must be extracted from the EXE. /extract <path> – Extracts the MSI contained in the EXE into the specified path. If the path contains spaces, it must be surrounded by quotation marks. Depending on the operating system, the 32 or 64bit GhostScript version must be installed – for iPapers up to version 2.99.1 the GhostScript version 9.18.1 is required. In the example, “user” and “password” must be replaced by the PAM login information. The AppID “2PC” is used up to iPaper version 2.99.1. If it can not be found in the installation folder, then 2.) is executed. If the file is not found there, an iPaper.xml file with predefined (fixed-coded) default settings is generated and stored in the standard path. In the iPaper.XML you can use absolute path data or system variables. In this example, the system variables% HOMEPATH% and% APPDATA% were used. This makes general presets and actions which can be used universally for all users.
! Note that the iPaper.XML is always written / overwritten when you exit iPaper. So you have to replace the application before you want to replace it. Otherwise the file will be overwritten with the last values from the user interface when you exit iPaper.